For this 2017 edition the chart has been fully updated throughout using revised depths where applicable. 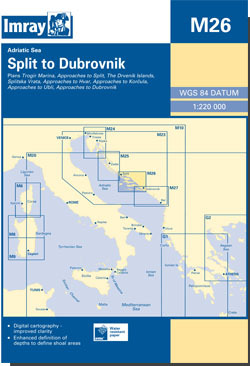 The sketch plan Approaches to Hvar and the Pakleni Islands has been replaced with a fully WGS 84-compatible plan. The sketch plan of Trogir Marina has been replaced with a new WGS 84-compatible plan of Trogirski Kanal, which shows the approaches to Trogir as well as detail of the Yacht Club Seget marina. The plan of Approaches to Korcula has been reschemed to show more of the approaches. On this 2017 edition the limits of marine protected areas have been added to the chart and port developments are shown at Split.